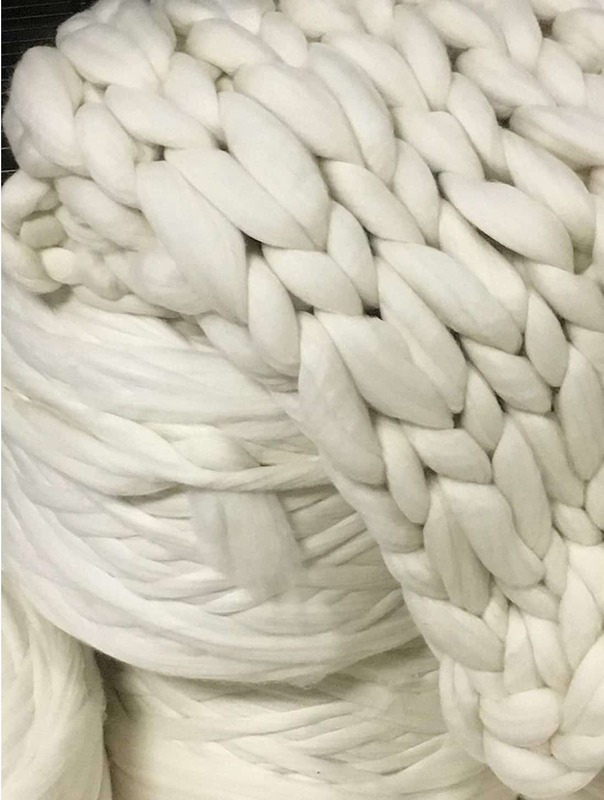 You know those super chunky knit blankets you’ve seen all over the internet that sell online for $300-$600 dollars? 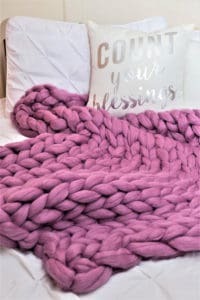 Arm knit blankets are so hot right now for a reason and it’s actually so simple to make a chunky knitted blanket with giant yarn at home! Well here’s a secret we’re going to let you in on, chunky knit and giant arm knit blankets are actually super easy to make and even a beginning knitter can complete and chunky knitted blanket project. What type of giant yarn you buy (smoosh wool, roving wool or acrylic) determines how much of it you need and also what type of chunky yarn you feel comfortable working with. The size of jumbo needles you use (or whether you use your arm or a PVC pipe) also determines how much yarn to buy. If you’re knitting blankets with arms and and using giant yarn, you’ll also be limited making a small throw blanket since you only have the span of your arm from wrist to elbow to work with. The smaller the needle, the tighter the knit, and that means the more yarn you need to purchase. If you don’t want to arm knit a chunky knitted blanket and prefer to use awesome jumbo needles, an easy option is to purchase a blanket kit that includes the pattern, the yarn you need and the needles! This is a GREAT kit option if you don’t want to arm knit a jumbo blanket and they make awesome Christmas gifts too! Colorways on Etsy has the highest rated chunky knit blanket products, gets rave reviews for being easy to work with and uses U.S. made high-quality merino wool from a local family farm! If you want something high quality and soft, buying high-quality merino wool is the way to go! Here’s Colorways kit for a 32″x54″ throw blanket (and free shipping). I JUST ordered this kit to make a chunky knit blanket for MYSELF for Christmas haha, and CANNOT wait! 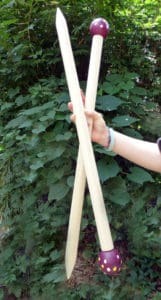 Check out those jumbo knitting needles!! There are a variety of end colors to choose from. I ordered the jumbo knitting needles with black and white polka dot tips! BUT!….. IF you want to ARM KNIT a chunky knit blanket for as cheap as possible with 100% wool, this NEXT yarn is the #1 favorite! If you’re wanting to learn more about knitting blankets with arms, this will help you get started! 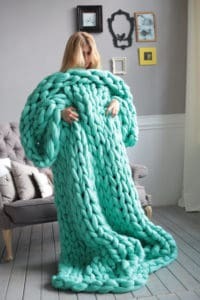 Using giant yarn for knitting with your arms is an extremely popular way to make a giant knit blanket. We love that it’ll not only bring down the cost of our project, but it’s also FUN. Your friends will be so impressed! You might have come across the term roving wool when reading about chunky knit blankets. Roving wool is 100% all natural wool. The Merino “smoosh” wool by Colorways is also 100% Merino wool, however, roving wool is in a more natural state and would require buying more yarn than smoosh wool. 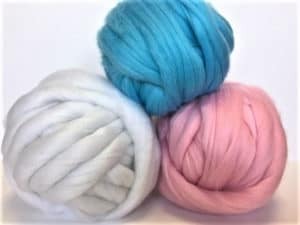 If you buy roving wool you’ll probably need around 7 pounds of wool (compared to 4 lb of smoosh merino wool) and roving wool is typically known for shedding a little more, but it won’t be an issue if you buy the right kind of roving wool. Roving wool will cost less per skein than the smoosh wool but you will need more of it. BOTH are great wool options! 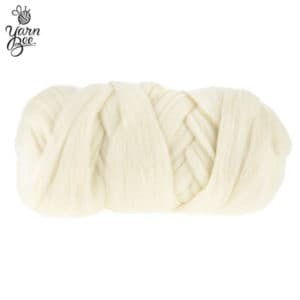 Here’s a giant roving wool you can even get on Amazon that’s very highly rated (4.7 out of 5 stars) It’s not on Amazon Prime, but it ships quick and y0u get a huge shipping price break by ordering numerous skeins together. This is also the Amazon Choice for chunky knit wool! Anika from Place of My Taste has a FABULOUS Youtube arm knitting tutorial on knitting blankets with arms using the Amazon Choice wool by Sheps Wools. Craft stores have a couple great options available for readers who are priced out of using 100% merino wool or simply just want inexpensive acrylic yarn or wool blend yarns. 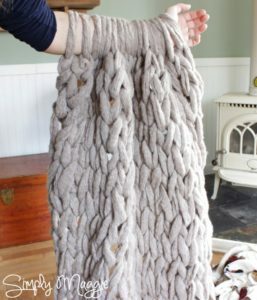 You CAN make a DIY chunky knit blanket cheap if you use our favorite inexpensive yarn. Hobby Lobby sells Yarn Bee Showstopper a wool/acrylic chunky blend that looks like the more expensive chunky wool you see everywhere online–for much less! It’s 15% wool and very soft and cozy. I also love that Yarn Bee Showstopper is machine washable on gentle cycle, many other giant yarns are dry clean only. We haven’t owned the Yarn Bee Showstopper for long, so we don’t yet know how it washes or how it holds up long-term. We made a chunky knit blanket with this arm knitting yarn and loved it! Craft store chunky knit yarn like Yarn Bee Showstopper is the closest giant yarn that looks like the chunky knitted yarn you see on Pinterest and Instagram. You cannot find chunky knitting yarn cheaper than this, especially when you have a Hobby Lobby coupon! TIP: When working with this yarn, it comes compact and at first appears less bulky than you might be thinking. You pull it apart slightly to get those wide chunky strands. The store won’t have enough in stock for a chunky knit blanket, you’ll need to order it online. I bought 4 of the 10 oz skeins and already need to order 4 more to make a decent size blanket. I had to carefully take the project off of my arm and put on a wrapping paper roll. This is a great yarn alternative to use to make a chunky knit blanket for cheap! The Yarn Bee Showstopper yarn is the same weight as Sheps Wool, and I highly suggest you use the Youtube video above as your example for making this blanket. Yarn Bee Showstopper doesn’t come in as many colors as the Premier Yarn Couture Jazz (in the next section), but it does look like wool whereas Couture Jazz is acrylic. It does shed a little, but this is normal for wool blend yarns. If this bothers you, you’ll need either acrylic yarn (which won’t be as chunky) or the Colorways Smoosh Wool featured above. Making an arm knitting blanket became popular with the Simply Maggie YouTube tutorial featured below. She used Premier Yarn Couture Jazz acrylic yarn that unfortunately is often sold out. (online in craft stores, not sold in stores)This is the least expensive option and you can even buy it on Amazon if you need it quickly. The tutorial has you arm knitting the blanket so you don’t have to pay for knitting needles. If you want an easy to follow free YouTube tutorial on arm knitting a chunky knit blanket, check out the 45-minute easy tutorial by Simply Maggie. I DO have this yarn and just bought it to make my teen son a blanket. We LOVE how SOFT this yarn is! Because it’ acrylic, it doesn’t shed. This will make a low cost cozy blanket, BUT, it is NOT as chunky and thick as the ones you see photos of on Pinterest and Instagram. IF you are looking for a low cost chunky knit blanket and don’t want to use wool, this is a great choice! This is also the perfect yarn for knitting blankets with arms since it has a little stretch to it. I ordered my yarn online ( comparing Amazon, Joann’s and Walmart) to see what the prices are by chance one is running a sale. I have NOT been able to find this in store. Here’s the basic pattern to follow, I highly suggest you follow along with Maggie’s arm knitting blanket video! Cast on 18 stitches using the long tail cast on method. She made a long tail of 5′, but because I used the Yarn Bee Showstopper yarn that’s a little thicker than this, you’ll need a long tail of 6′-7′ for a blanket if you buy Yarn Bee instead. Weave in the ends. Some people hand stitch the ends to keep it from unraveling later. When reading the reviews about her arm knitting blanket project, the actual amount of project time seemed to range between 45 minutes to 3 hours. Assume it takes a little longer if you’re brand new to knitting! Once you figure out how to cast on, yes, I think the rest of it can be made in 45 minutes. Make sure you can work on your arm knit blanket project in one sitting without distractions! Another great chunky knit yarn seller that sells a wide variety of COLORED chunky yarn that’s from Australia, is the Etsy shop by Becozi. Roving wool sheds more than the smoosh merino wool, she recommends either felting it or getting the blanket dry-cleaned before using it would help reduce shedding. Becozi also sells jumbo needles, chunky yarn blanket kits, vegan wool and also chunky yarn finished products like pillows, cat beds, a Christmas tree skirt and other fun items! According to Country Living Magazine, the “original” creator of this simple yet stunning blanket is by blogger Laura Burik of Nocturnal Knits, who started selling the online patterns for this blanket in 2011. Because of social media, this blanket didn’t go viral until early 2017. Laura makes her chunky knit blanket with cheap PVC pipe, you can get her project tips here if you want to use pipe needles. If knitting blankets with arms just isn’t your thing but you want to make a chunky knit blanket cheap, using PVC pipe is a great option! Laura knits with inexpensive PVC pipe (1.5″ wide x 5′ long) you can purchase at Lowes or Home Depot. Cost wise, the yarn will run about $120+ and the supplies about $40-$50 since she suggests a felting mat. The cost is similar to Colorways Smoosh yarn but her blanket is a little larger, it just depends on if you want to use processed wool or natural wool. Where to Buy a Chunky Knit Throw? If you decide to buy a chunky knit blanket instead of making one, here’s my favorite resources for finding the perfect chunky knit blanket. These sellers can all be found on Etsy. After reading info about countless sellers, here’s my round-up of the one’s I recommend based on buyer reviews. MAKE SURE YOU SELECT WHAT SIZE OF BLANKET YOU WANT TO ORDER, OTHERWISE THE LINK MIGHT DEFAULT TO THE SMALLEST SIZE! 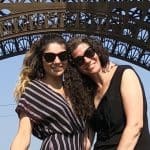 Woolaty is another popular Etsy seller of chunky knit blankets, keep in mind she’s in the Ukraine but ships quick and provides great service! 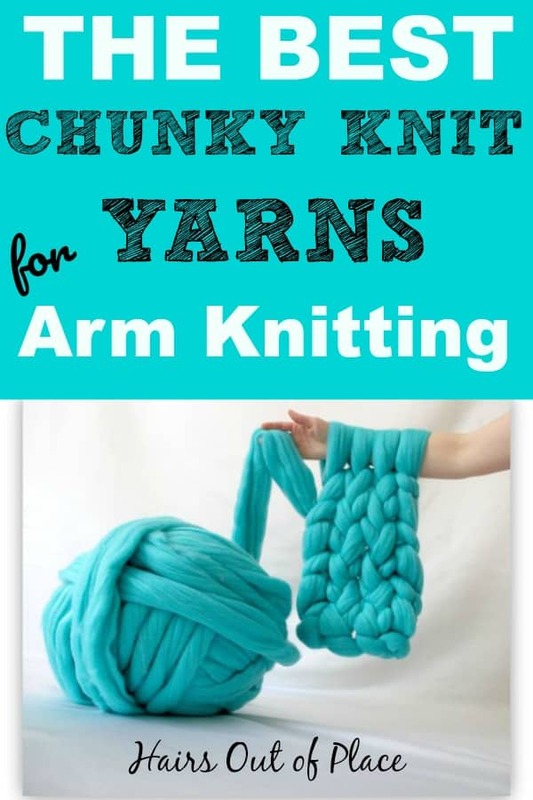 Be sure to check out our post on The Best Chunky Knit Yarns for Arm Knitting! It’s a must read if you’re making a chunky knit blanket! If you make a chunky knitted blanket, please post a photo below or on the Pinterest pin! We’d love to see what other projects you’re working on with giant yarn too! Whether you’re knitting blankets with arms, using a PVC pipe, or buying giant needles, we know you’ll love learning how to make a chunky knitted blanket. Have you tried washing the yarn bee Showstopper yarn in a washer? Did it stretch? How did it turn out? Hi Stephanie! I have not washed our blanket yet, but this is making me want to knit a small sample piece and see how it holds up! I’ll try to do that this week and report back. For the Yarn Bee chunky knit yarn from Hobby Lobby (17.5 oz/30 yd), how many skeins of this does it take to make the arm knit blanket? Thanks for all the info you provided in your post! Hi Debra! Sorry for the delay, my website isn’t showing I have messages for some reason. I’d get between 8-10 skeins to make a throw blanket! With arm knitting you’re limited in the blanket width, so the blanket will be about 3′ wide.